Japanese MetalHead: MMP / JMH Show "For Japan"
This is what I kinda do. I host the Metal Moment Podcast. Available on iTunes. Guitars, Drinks, Food, Music, Technology and my Dogs. MMP / JMH Show "For Japan"
This episode is dedicated to the People of Japan. My life changing experience in Japan during the 3-11-2011 EarthQuake. My thoughts, listener email, and a phone message. 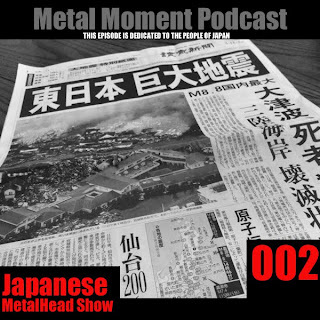 First collaborative episode of the Metal Moment Podcast and the JapaneseMetalHead Show. Complex sake like flavors with malt sweet notes. Hints of strawberries in the nose and palate. An intriguing mix of sake, malt , and bitter notes in the finish. www.fearshop.com and use the PromoCode “MetalMoment”, to receive an instant $3 discount on all purchases. FearShop.com Only carries Officially Licensed Merchandise from Metal Bands. Life if short, Life is Good. Enjoy.